Rob is a native of Wisconsin and has lived in Bend since 2003. Prior to landing in Central Oregon, his travel adventures took him out west with stops in Jackson, WY, and Seattle, WA. He has yet to make a U-turn back to the Midwest. 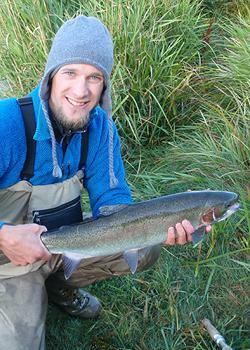 While Rob moved to Bend for the mountains, he has fallen in love with Oregon’s rivers. He is an avid steelhead fisherman, and during the summer and winter months, you can find him with a Spey rod in hand and his trusted blue heeler, Kenyon, by his side on the Deschutes and North Umpqua rivers. He also enjoys trail running, skiing, and tying steelhead flies. A self-described ambassador of Wisconsin, Rob will gladly share the finer principles of deep-fried cheese curds, bratwurst, and tailgating. He also enjoys an annual trip back to Wisconsin to catch a Badger or Green Bay Packer game and has been known to have shipments of bratwurst shipped to the high desert. While Rob moved to Bend for the mountains, he has fallen in love with Oregon’s rivers. He is an avid steelhead fisherman, and during the summer and winter months, you can find him with a Spey rod in hand and his trusted blue heeler, Kenyon, by his side on the Deschutes and North Umpqua rivers. He also enjoys trail running, skiing, and tying steelhead flies.